Judgement is Coming. This September. Awesome. 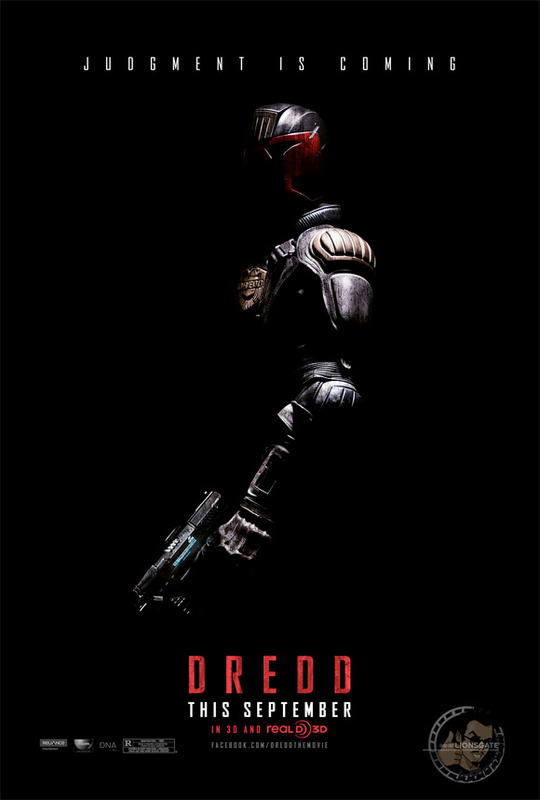 Lionsgate has unveiled their first dark, badass teaser poster for Pete Travis' Dredd (I don't know why I'm the only one excited for this? ), starring Karl Urban as the new Judge Dredd. We've already seen plenty of photos and early teaser art for this new take on 2000 AD's Dredd, as it has a bigger following in England and Europe than it does in the US. But JoBlo has finally unveiled what looks to be the first official US teaser poster, for its release here in September. It's simple, but a bold enough tease, I dig it. I'm still very much looking forward to this, but it's probably only me. Check it! Dredd takes us to the wild streets of Mega City One, the lone oasis of quasi-civilization on Cursed Earth. Judge Dredd (Karl Urban) is the most feared of elite Street Judges, with the power to enforce the law, sentence offenders and execute them on the spot – if necessary. The endlessly inventive mind of writer Alex Garland and the frenetic vision of director Peter Travis bring Dredd to life as a futuristic neo-noir action film that returns the celebrated character to the dark, visceral incarnation from John Wagner and Carlos Ezquerra's revered comic strip. Dredd is set for release in the US on September 21st this fall. Awesome? I'm hopeful this one will turn out better than the last one. Actually, I'm still trying to forget the last one. I'm a big fan of both the Dredd comics and of Karl Urban, so I'm cautiously optimistic. I already dread September. I don't need some poster to tell me to hate it. Dont you mean you "dredd" it? Sorry couldn't help myself. Im torn. This could be mindless awesomeness but it could easily be utter horse crap. There's no way to tell. But...the poster's OK...I guess? Man, it seems like they've been filming this movie since forever..If this is successful, then hopefully they'll do an ABC Robots movie..
excellant poster,now where trailer? or a teaser? looks good. keep it simple = win. I don't see this film being any good, nonetheless it's a really good poster. Hey Alex, Very similar to our 2003 movie posters for a project we've been working on for years to get off the ground which was tentatively titled "Road Kill," but since several other movies have used that title we've changed it to "Body Count." We even approached Lionsgate with this project some years ago. I don't know if this sort of thing will be interesting to your readers or not but they can see the updated posters on the IMDb by looking up Desi Singh and navigating to the photos page. We're currently working with Verge Films' Gilberto Vera to hopefully produce 'Body Count' by the summer of 2013. Was that the same Stallone who loved his costume so much he threw it off as soon as was humanly possible? "and the red 'X' is directly in front of where his eyes should be. " Ever heard of suspension of disbelief? Did anyone watching The Dark Knight suddenly think to themselves: "I'm watching a man dressed as a Bat beat up a man wearing clown makeup?" I know I didn't. I just enjoyed an amazing movie. Here is another early poster that evokes the same feeling along with posters updated a couple of years ago for your readers' to check out. Obviously we don't have the kind of budget Dredd has but hopefully we can make a fun movie out of it all the same. We're keeping our fingers crossed that this project will finally see the light of day. We'll keep you up to date with casting news and any other news worthy developments as it moves forward. You're right! I'm a huge fan of Karl Urban and should bring a fresh interpretation to the character. Not really liking the helmet though, it looks a little too clunky IMHO. Still it should be a fun movie that I'm looking forward to. By all means keep the helmet on but streamline it so it doesn't look so clumsy. Karl urban has been a favorite of mine. Hope this will be great and big for him.